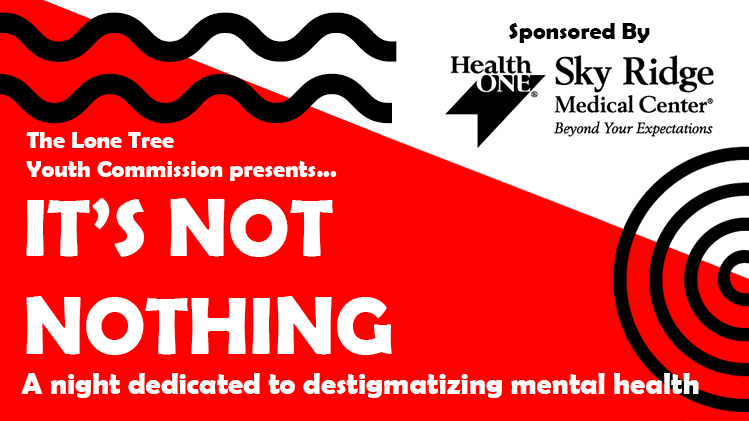 The Lone Tree Youth Commission is proud to present It’s Not Nothing, a night dedicated to destigmatizing mental health for high school-aged students. The night will start with a performance produced by the Youth Commission and local area students. The audience will then hear from 3 engaging speakers covering mental health and suicide prevention. This event is made possible because of support from Health One’s Sky Ridge Medical Center. The Lone Tree City Council established the Youth Commission in 2009. The Commission is comprised residents of Lone Tree that are currently enrolled in 8th -12th grade. Members host events focused on issues concerning youth in the community and act in an advisory capacity to the City of Lone Tree’s City Council on matters pertaining to the youth population.